Lately, there has been a flurry of interest in homebrewing crystal ladder filters. Much has been written on methods to characterize crystals with the goal of obtaining parameters that can be fed into a filter design program, and there is a lot of good cookbook information on how to design, build and test ladder filters on the net. I’ve built dozens of these filters over the years, and I’m now to a point where I can almost estimate the circuit values, build it up quickly and tune it to the desired performance. In this article, I want to discuss what’s really important when characterizing crystals, how to estimate unknown parameters from a couple of easily measured known values, and the implications of measurement /estimation errors. First, let’s review the equivalent circuit of a typical quartz crystal. In this plot, the natural series resonance of the crystal is the peak at exactly 9 Mhz . For this particular crystal, the transmission loss at peak is down approximately 1.0 dB, mathematically implying that Rs is about 10 ohms. Notice that there is also a deep notch in the frequency response about 10 Khz above the series resonant frequency. This is a ‘spurious’ resonance caused by the capacitance of the electrodes that are plated on the surface of the quartz in order to electrically excite it. This capacitance, which is typically between 2 and 5 pf, is shown as Cp in the equivalent circuit, and the associated resonance it causes is called the ‘parallel resonant’ frequency of the crystal. As the dotted phase line indicates, the region in between the series resonant and parallel resonant frequencies produces a 90 deg phase angle between the voltage across the crystal and the current flowing through it. This implies that this reqion in the crystal’s frequency response is inductive. This is, in fact, the region where most oscillator circuits excite the crystal. 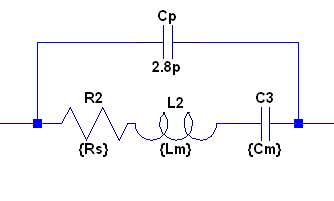 The crystal’s net inductive reactance operates against the circuit’s ‘load’ capacitance to effect a ‘circuit resonance’, and that’s what frequency your oscillator produces. Note that it’s exceedingly difficult to make an oscillator that operates exactly on either the natural series resonant frequency or the internal parallel resonant frequency. Also note that a crystal that is specified as ‘parallel resonant’ mode is not really resonant at the marked frequency; the oscillator it’s built into will oscillate at a frequency where the circuit’s capacitive reactance equals the crystal’s inductive reactance. This is why you can ‘pull’ a crystal oscillator’s frequency by adjusting the load reactance. What Parameters are Important to Measure? This is, by a very wide margin, the single most important parameter to control if you want a nice flat-top SSB filter or a nice smooth & sharp CW filter. All the crystals in the filter should be measured to ensure that the spread of frequencies is as tight as possible. A good rule of thumb is variation of no more than 5% of the filter bandwidth. For instance, for a 2.5 Khz SSB filter, try to select crystals that are within 125 Hz of each other. The more frequency variation between crystals, the more ripple you’ll have in the passband. Note that you don’t need a very accurate frequency counter to do this matching; what’s important is frequency differences, not absolute frequencies. You can probably even do it with your station receiver if it’s a modern stable synthesized unit.I’ll write more about how to do this later. This is one of the last things you’ll do when you design & build your filter, but it’s second on my hit-list of things that can adversely affect filter shape. We’ll return to this. There are numerous methods to determine the values of Cm & Lm. These include measurements with signal generator/detector setups, special test oscillators such as the G3UUR method and more. A good summary of these methods can be found in this paper.The important thing to note here is that, at series resonance, the reactance of Lm will equal the reactance of Cm, so if you measure one, you can calculate the other one. Actually, you can’t directly measure either one, so you have to use indirect methods. It’s important to understand that some of these indirect methods require indirectly measuring the value of Rs first as part of a complex process to indirectly measure and calculate the crystal’s Q which ultimately leads to a calculation of Lm and Cm. As I’ll discuss later, the value of Rs really isn’t useful for anything else except to predict what the filter loss will be. Now, here’s the important thing I wanted to impress on you…the exact value of the motional reactances (XLm and Xcm) really aren’t that critical. Within a batch from a single known manufacturer and after the frequency matching process above is complete, they won’t vary much from one to the next, and the only thing thing typical variations will materially affect is the filter bandwidth. This bandwidth variation will be approximately one for one with the parameter variation, so even 10% has little effect. I usually don’t match crystals for motional reactance. I pick one from the frequency matched set, and use it’s motional properties for the design. Extensive LTSpice analyses have borne out the validity of this simplification. Rs variations from crystal to crystal in a 6-pole filter and have never seen show-stopper issues. The only major affect of Rs on filter performance is increased filter loss, and all of the crystals would have to have elevated Rs levels to see any significant effect. Further, what you get with the average value of Rs is what you get. You have to accept the filter loss for what it is unless you can specify that all the Rs values meet your specifications. So, it comes down to knowing in advance what the filter loss will be and accepting it, or finding out at test time and accepting it. In any case, with decent crystals, you can assume a 6-pole filter will probably have between 1 and 2 dB loss. Adding more sections will increase the loss proportional to the increase in number of sections. I see little need to match Rs, or even measure it if you use my characterization methods. As I mentioned above, numerous LTSpice simulations have led me to the conclusion that frequency matching the crystals is the single most important factor to getting a nice frequency response in your filter. The conventional wisdom here is to build a test oscillator, plug in your crystals one at a time, and measure each of their frequencies using a counter with lots of resolution and lots of precision. We can immediately dismiss the stipulation that the counter has to have high accuracy, since we’re not really interested in the absolute frequencies of the crystals, but rather how close to each other the frequencies are. Given that the frequency variations we expect to see between crystals will be only a couple Khz absolute worst case, then the real requirement is that the counter have lots of ‘resolution’, not ‘accuracy’. In other words, the counter needs lots of digits in its readout, preferably down to 1 Hz or 10 Hz. It doesn’t need a particularly accurate time-base though. What’s really important is that we can accurately measure the ‘frequency difference’ between crystals. As long as the counter time-base doesn’t drift much over the time it takes to measure all the crystals, then virtually any counter with enough digits will do. -Build your test oscillator and put any crystal from the batch into it. Arrange for some way to couple some of the oscillator energy into the receiver so you can tune into it clearly. Joe, very clear and quite helpful. Looking forward to hearing what else you have learned over the years. Right now, I’m all over the place topically, as there’s so much content on the site that needs fleshing out. I intend to take this topic farther as I get time, right down to building and testing. After this one, I want to do one on mixers, as that’s another topic that seems to be mystical to a lot of people.